Prepare brownies per package instructions, adding 1 cup Taco Seasoning during blending step. Mix together chocolate sauce, 1 1/2 cup Taco Seasoning and 1/2 cup hot water until smooth. 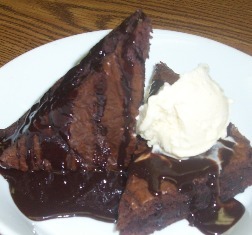 Slice cooled brownies and top with ice cream and spicy chocolate sauce.